NASA's Juno mission is exploring Jupiter from orbit, beaming back amazing photos, atmospheric data and other observations about the largest planet in our solar system. The Juno probe launched Aug. 5, 2011 and arrived in orbit around Jupiter on July 4, 2016. It is the farthest space probe ever to be powered by solar arrays. 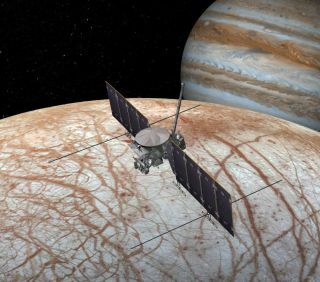 The $1.1 billion mission is expected to run through July 2021, but the science of Jupiter it returns will last a lifetime. Learn more about Juno's Jupiter discoveries here. Science and art each teach us to see the world in a different way — and Candice Hansen is living in both those worlds simultaneously, thanks to her role leading JunoCam. NASA’s Parker Solar Probe just got closer to the sun than any other human-made object in history. Jupiter and Earth may look like two completely different planets, but the planets' atmospheres seem to have something in common, new images from NASA's Juno mission have revealed. The atmosphere of Jupiter has distinctive belts, bands and a massive swirling storm. NASA's Juno spacecraft caught a quick glimpse of a "brown barge" emerging from the silky bands across Jupiter's southern hemisphere. NASA's solar-powered probe will give us a better idea of Jupiter's weather, magnetic field and formation history. Watching the clouds go by here on Earth is entertaining, but now we have an even better view of some stunning clouds on another world — Jupiter. What does it take to get a Rottweiler on one of Jupiter's moons? Quite a lot, actually.